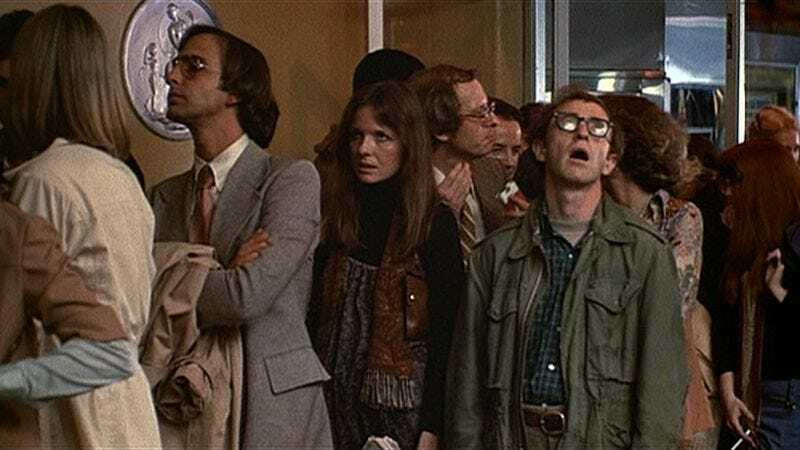 Variety reports the Writers Guild Of America has named Woody Allen and Marshall Brickman’s Annie Hall the funniest screenplay of all time. In completely unrelated news, the voting body of the Writers Guild Of America is largely comprised of socially awkward introverts who chose a life hiding behind a computer screen (or typewriter), punching in words, as a way to avoid the crippling anxieties of the real world. In yet further unrelated news, this is also an utterly foreign perspective to the staff and commenters of The A.V. Club. The ’70s comedy took the top honor at a ceremony announcing the 101 funniest screenplays as voted on by the WGA. It led the top five, followed by Some Like It Hot, Groundhog Day, Airplane!, and Tootsie. Fittingly, This Is Spinal Tap’s script took the number 11 spot, which writer-director (and host of the event) Rob Reiner was quick to make a joke about, because that’s the thing the guy says in the movie, and references officially became a food substitute for writers sometime around 1988. Also, this list is a giant sausage party, with the only women in the top 20 being Nora Ephron (for When Harry Met Sally…, number 15) and Annie Mumolo and Kristin Wiig (Bridesmaids, number 16). From there, it’s a steep drop down to number 44 and Big, co-written by Anne Spielberg and Gary Ross. Still, the complete list is an excellent look into what kinds of movies and screenplays have endured the test of time, as well as what movies are considered “funny.” For example, The Graduate makes the list at number 27, and the Coen Brothers are well-represented, as they should be. Rob Schneider has yet to comment, but given the lack of Deuce Bigalow representation on this list, a statement is presumably forthcoming.